Google Earth is an interactive, virtual globe that enables you to find and explore just about any location on our planet and beyond. Google has updated its very popular imagery and terrain exploration software. The new Google Earth for Windows desktop includes a new Tour Guide and some 3D imagery. The Tour Guide will show you famous landmarks and natural wonders and is available for over 11000 locations in 110 countries. It serves as a local expert, suggesting nearby places you might want to explore and helping you learn about those locations. Google Earth is an interactive, virtual globe that enables you to find and explore just about any location on our planet and beyond. Google Earth lets you fly anywhere on Earth to view satellite imagery, maps, terrain, 3D buildings, the ocean and even galaxies in outer space. Explore rich geographical content, save your toured places, and share with others. Video tutorials: Tutorials on how to do basic tasks like create placemarks, record tours, etc. More products: Information on related Google products. Community: Various ways to connect with other users, such as the Google Earth Twitter account. Industries: Information for educators, media, developers, etc. The new version now includes 3D imagery for cities like Boulder, Boston, Charlotte, Denver, Lawrence, Long Beach, Los Angeles, Portland, San Antonio, San Diego, Santa Cruz, Seattle, Tampa, Tucson, Rome and the San Francisco Bay Area and also adds more 3D imagery for regions like Avignon, France; Austin, Texas; Munich, Germany; Phoenix, Arizona; and Mannheim, Germany, which will allow you to take flight over entire metropolitan areas in 3D. To install it, you will have to download its small web installer, which in turn will download the main setup file. 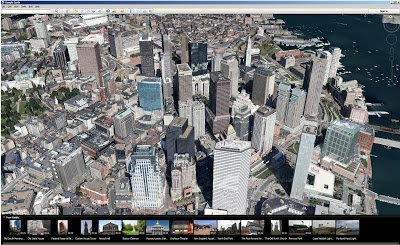 If you wish to customize your download or want to download the offline full installer, click on the Customize your installation of Google Earth with advanced setup link. You may also want to decide about the pre-checked boxes, which will download Chrome browser and make it your default browser. You can download Google Earth from here. This post will help you if Google Earth is not working on Windows 10. Google Sky will let you view celestial objects. Google Body Browser lets you explore the human body! and it is remarkable to observe the quality of this application in 3d.